Questions about banking keys, killstreak kits, MvM parts and skins. Why are there no keys available to buy? We don't always have keys in stock. We only get more in stock when other users sell keys to us. This is heavily dependant on the current market situation and key prices. 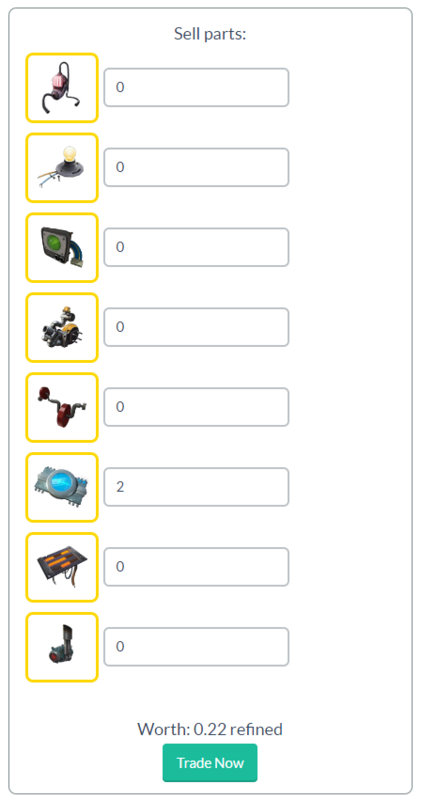 Which keys can I bank? 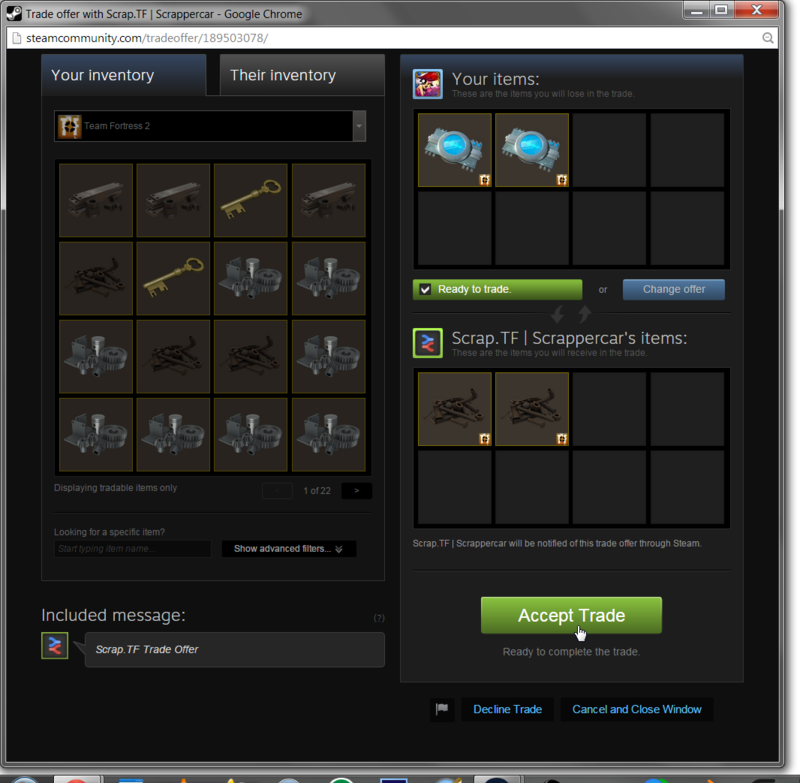 In this banking we only accept normal Mann Co supply crate keys. This means that we do not accept other keys like : EoTL keys, nice keys, naughty keys, summer keys, etc.. We also do not accept/buy keys that were event keys and turned into normal keys. Does killstreak banking have a stock limit? Yes, it does. The current stock limits are 5 basic variant of a kit, 1 specialized variant of a kit, and 1 professional variant of a kit. For example: If one bot has 3 basic kits and the other bot has 2 basic kits of the same item, they have hit the stock limit because 3 + 2 = 5 kits in total. My kit isn't showing up! The kit which you are trying to sell might have hit our stock limit or it might not have a price set yet. You will have to wait until our bots sell some of that kit or until our price manager sets a price for it. The bot keeps saying that it will pay 0 ref for my parts! If you are experiencing that "issue" then it's because we probably aren't buying the parts that you are trying to sell to us at this moment. Make sure to check the price chart. Example : Reinforced: 0/0.05 -> We currently aren't buying any reinforced parts. How do I buy Robot parts? This is a guide on how to use Mann Vs. Machine part banking. I want to buy some Mann Vs. Machine parts for metal, how do I buy these? This is the Mann Vs. Machine banking page. You'll see a list of bots when you click the "Buy Parts" button. Choose a bot to continue. Here you choose the part(s) you want to buy. I've selected two Battle-Worn Robot Taunt Processors. You can choose to pay with Metal or your Robo Parts + Metal. I wanna pay with metal only so I press the "Offer Metal Only" button. You're now in the queue to buy the Robo-Part(s) you selected. You might be in a queue for a minute or so. You've now succesfully completed a Mann Vs. Machine Robo Part trade! Congratulations! How do I sell Robot parts? I want to sell some Mann Vs. Machine parts for metal, how do I sell these? This is the Mann Vs. Machine banking page. Click the "Sell Parts" button to begin. You'll be in a queue once you've pressed the "Trade Now" button. You're now in the queue to sell your Robo Parts. You can see the queue at the top of the screen. I'm currently in a "global queue" which is what you'll be in at the start. Then you'll be assigned to a bot to trade with it. You might be in a queue for a minute or so. What does the "autocomplete fabricators" option actually do? 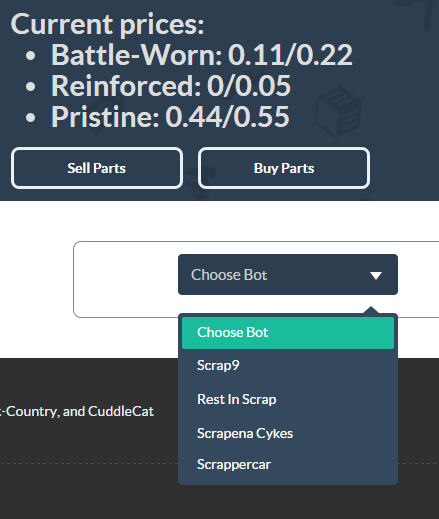 This option/feature makes the bot detect the fabricators in your backpack and automatically sends you a trade offer with the parts that you are missing in order to complete it/them. No bots are showing up when I select that I am buying parts! That's because all of our bots are full, you will have to wait until they have more space in their inventory. You can check their inventory capacity by going to the about page. What is the stock limit of skin banking? The stock limit is of two units per wear of that skin. This stock limit is global, meaning that if one bot has one unit of said skin with a certain wear and the other bot has the same skin with the same wear, we won't be buying it. Some user gives items to the bot for free, giving them away. 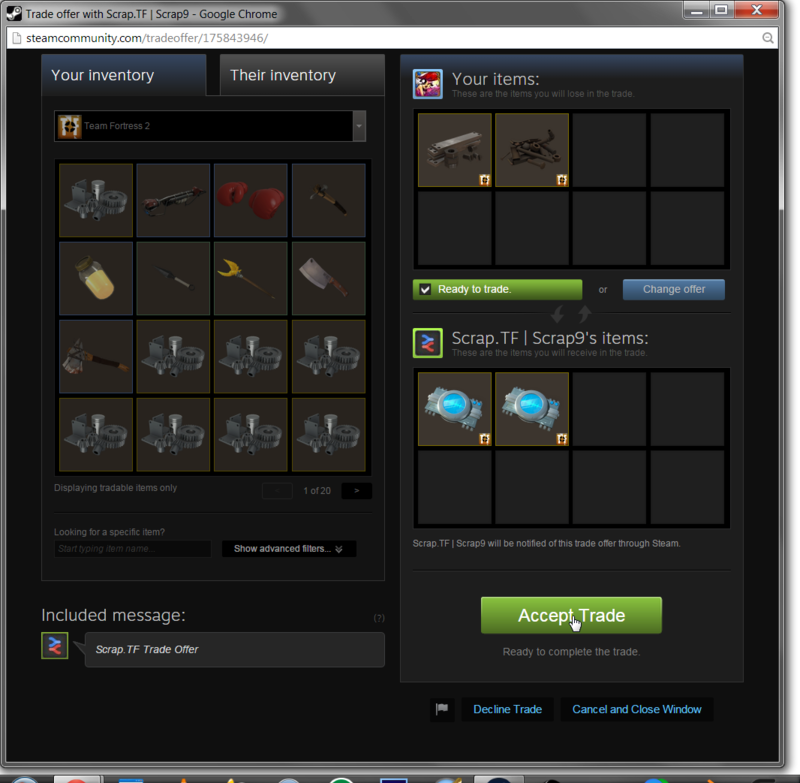 Some other user notices that the bot has items in it's backpack and "buys" them (like every other banking). That other user gets the items for free. This bot has metal in it's backpack and I can't grab it! That's because all of the metal that is being stored in such bot is used for future item/site refunds or for other situations which is urgently needed. Why is the incinerator bot always empty? That's because the items which have been incinerated have quickly been grabbed by other users. Staff does not put items in the incinerator bot by request.